VFAB.org is the portal of web-based materials simulation platforms operated by the Computational Science Center at Korea Institute of Science and Technology. 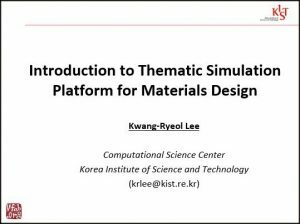 Since 2009, Researchers in CSC-KIST and their collaborators have been developing thematic platforms for materials simulation and design. In contrast to the conventional platforms that provide a convenient working environment for each simulation code, we build a virtual laboratory of specific theme such as “virtual lab for nano-device optimization” or “virtual lab for the design of secondary battery materials“. In these web-based virtual laboratories, users can obtain the advanced multi-scale simulation results following the workflow very similar to that of real experiment. Users will prepare the sample, do some experiments virtually and analyze the virtual sample as they usually do in the real laboratories. No input parameters directly related to the simulation code or computational condition are asked. The optimized computational method are already set by the computation experts (who actually build this platform) based on their plentiful experience and know-how on that specific simulation. The concept of the vfab platforms are described in the following presentation.